Sony at CES 2016: 5 things we learned | What Hi-Fi? With 4K HDR TVs, turntables, wireless speakers, Blu-ray players and headphones, there was no shortage of announcements from Sony at CES 2016. There’s no doubt that Sony had one of the longest lists of announcements of the Big Four at CES 2016, with everything from TVs and wireless speakers to Blu-ray players and turntables. Wondering how to get your head round all the news? Allow us to highlight five key points from the Sony news so far. ...or at least it looks that way. While Sony announced that many of its 2016 4K TVs would support HDR content, it also announced its own 4K HDR logo that any compatible products would carry - instead of mentioning the one announced by the UHD Alliance earlier in the show. Like Panasonic, LG and Samsung, Sony is a member of the UHD Alliance, so its decision to overlook 'Premium UHD' is a little confusing. We’ll keep you updated with anything we hear. Either way, the new flagship XD93 TV, Sony’s thinnest ever curved display and one that introduces Sony’s new Slim Backlight Drive technology, looks interesting, thanks to promised brighter highlights and darker blacks. Despite a big move towards mobile phones for listening to music on the go, Walkman is one of those brands that has weathered the storm - and Sony announced a new addition to its range in the form of the wearable WS413. Aimed at fitness fanatics and holiday goers alike, the WS413 features an all-in-one design with built-in headphones that can withstand sand, dust and even salt water. With a choice of 4GB or 8GB onboard stoage, it’ll offer a 12-hour battery life, plus packs a quick charge function that will squeeze in 60 minutes of music from a 3-minute charge. Unfortunately, the WS413 isn’t capable of high-resolution playback but we did hear some whispers about a new high-res Walkman at CES – we’ll keep you updated on anything more that we hear. Unlike Samsung and Panasonic, Sony had no announcement of a 4K Blu-ray player at CES 2016, instead choosing to focus on 4K upscaling players instead. For those craving native 4K content, Sony did announce a new 4K streaming app called Ultra for Sony Android TVs, which offers 4K films from Sony Pictures for streaming and download. UK availability is still unclear at the moment. There will be a 4K upscaling Blu-ray player, but we know that's no real substitute for the real Ultra HD deal. One of the more surprising announcements from Sony was the PS-HX500 turntable (£400), a deck that is capable of playing back your favourite vinyl - and also capable of ripping it. With a newly developed tone arm and aluminium die-cast platter, the PS-HX500 is belt driven by a two-speed motor and has a 30mm high-density acoustic plinth and 5mm rubber mat. It comes with a moving magnet cartridge included and packs an integrated phono preamp for hooking it up directly to your amplifier. So far, so classic, but where this model differs from your traditional deck is what Sony is calling a built-in ‘DSD native converter’ that allows you to rip your vinyl to any format, from WAV up to hi-res. It’s fair to say we’re a little sceptical about those claims, but we’re looking forward to getting our hands on it all the same, and it joins the new Technics SL-1200 turntable in spearheading the continued vinyl revival. Dolby Atmos has so far been overlooked by Sony HQ, and 2016 doesn’t look to be the year that’s going to change. There was no mention of Atmos on Sony’s STR-DN1070 AV receiver, a feature that some of its biggest competition will be (or already are) offering around that popular £500 price point. The 7.2ch amp is, however, more 4K friendly this year, with all six of its HDMI inputs supporting the HDCP 2.2 standard. There is also a new DAC on board for improved audio quality. While Samsung made its CES Atmos move in the shape of a soundbar, that too evaded Sony, despite announcing three new soundbar models and a soundbase. 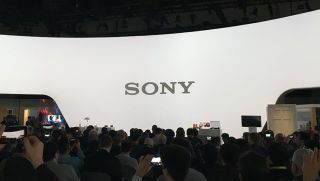 Instead, the focus seems to be on offering a simpler, wireless solution for 5.1 surround sound, with all of Sony’s AV products supporting the setup of wireless rear speakers via Sony’s Songpal app.